I knew I was pressing my luck. And so it follows that, for flight number four, two days later on a Sunday afternoon, I sat with my family of five on the tarmac for three hours only to ultimately return to the gate. A few hours after that, the flight was canceled. By my math, the overnight delay cost our family about $500: two $104 hotel rooms at the ALoft, one (terrible) dinner for five at that hotel, breakfast at the airport, an extra night of parking my car at LaGuardia, an extra night of care for our dogs, and a taxi from JFK to LaGuardia since our flight home landed at JFK. The flight attendant is frustrated because she has no information or control, and the passengers are upset. The gate agent is powerless. He just got assigned to the gate. He has no information and no discretion, and it feels terrible to give angry passengers nothing. The airline has no obligations. It’s all spelled out in the fine print. The one lone woman working at the hotel front desk has such a narrow job that she transfers the call three times to the van pickup and, when it goes to voicemail, she has no recourse. The bartender has a big smile and pours a nice cold beer, but when we order a full meal off the bar menu he looks terrified. It turns out that the “grilled cheese with tomato soup” at the ALoft Raleigh-Durham is a microwaved hamburger bun with some semi-melted cheese and Cambell’s soup, all served lukewarm—because he has no chef, no pan, no stove, nothing. We’d ordered four of them. While our 24 hours delay with a family of five was tiring and expensive, what I noticed most was how much it cried out for an ounce of humanity. The economy we’ve built optimizes so much for efficiency that there’s no space for human agency. Every step is a tiny transaction in which both people standing across from each other—service provider and service recipient—are powerless. It’s dehumanizing by a thousand cuts. On the bookends of this trip, I got to spend some time talking to Lily. Lily works at The Parking Spot at LaGuardia airport. So I asked her for advice, since LaGuardia is under construction and every place was full. We talked a bit more then Lily paused and asked what time I would arrive. “Three o’clock,” I told her. When I arrived, Lily and I both discovered that we knew each other a little. About a year ago, my wife and I were leaving from / arriving to LaGuardia on the same day. The best way for us to make it work was for my wife to pick up the car that I’d parked a few hours prior—without a car key, without the ticket, and with a different last name. Randomly, I had chosen The Parking Spot and ended up explaining this long-winded plan to Lily. She was great. I think she thought it was funny. She helped. My wife got the car. Lily acted like a human being. The same thing happened with Lily this past Friday when I called, and on Monday the five of us rolled in, exhausted after a 24 hour delay. She laughed. She cracked jokes. She put everyone at ease, not because she has to but because she obviously finds joy in being helpful, saying hello, being human. And, to state the obvious, where do you think we’re parking the next time we fly out of LaGuardia? The infinite, micro-losses we’ve created in today’s hyper-efficient world are epitomized in how remarkable Lily’s behavior is: in making every transaction smoother and a little bit cheaper we disempower everyone, and no one misses what’s been lost until it’s too late. Care, kindness and humanity now feel like luxury goods. There is, however, a silver lining: it’s easier than ever, against this backdrop, to have the smallest actions stand out as exceptional. You can do this from the front lines. You can do this in how you build your company culture. It’s easier than ever to be noticed, to have a bright splash of color be seen in an increasingly monochromatic economy. You might have noticed that apologies don’t need to happen just once. The first time, the words can catch in your throat. You might sound a bit defensive, even reluctant, a bit like the little kid who looks at the ground, mumbling almost unintelligibly as his parent nudges him forward to say “sorry.” What’s going on is either that you don’t fully believe your own words, or you sense that the person you’re speaking to isn’t totally ready to hear you. The second time you apologize, you’ve gotten past the noise in your head (“I’m not the only one who did something wrong!”) and the self-congratulations (“I’m such a martyr”) and started to get in touch with real feelings. As these feelings of remorse start to be visible, you begin to build an emotional bridge between you and another person. And the third time, well, the third time you are fully grounded in the truth of the wrong you’ve done, the hurt you’ve inflicted, the unnecessary slight, and you can match those feelings to the words you say and to how you say them. When that comes out, you can truly apologize and begin to set things right. Of course there’s nothing special about apologies. This is the way it goes with any communication that has real, challenging emotional content, including expressions of humility, gratitude, requests for help, even communicating the joy and hopeful enthusiasm you have for a job you want, joy that is often buried beneath layers of seemingly-appropriate responses. There are no shortcuts to expressing your emotional truth. There’s just the progressive work of discovering it, and then having the courage to reveal it. Every nonprofit fundraising campaign is about closing the imagined distance between a person and an issue. The imagined distance between health today and a potential disease tomorrow. Or the imagined distance between you and someone who is suffering from that disease today. The imagined distance between the safety you feel today and the potential of being a victim tomorrow. Or the imagined distance between you and the person who is a victim today. The imagined distance between the rights you take as a given today and the loss of those rights tomorrow. Or the imagined distance between you and a person who does not have those same rights today. The imagined distance between me and you, when “you” is someone I think I don’t know, someone I think is different from me, someone I have been choosing to look away from. Once it’s revealed and felt that this distance is just a mirage, a construct that allows us to hide from our shared connection and shared humanity, then and only then is it time to explain why your organization, your intervention, your solution is going to make a difference. But step 1 is to break down those walls – walls that create safety but that also create separation. Because, ultimately, while safety creates comfort, it doesn’t hold a candle to what people really crave: connection, meaning, and a sense of purpose. On Monday I noticed a tweet from the nonprofit fundraising site Razoo, quoting a blog post of mine from 2012. It was the elegant graphic they’d created from my blog post that made me do a little jig. The bonus was when I scrolled I saw that the other folks they’d quoted recently: Roald Dahl, Ralph Waldo Emerson and Mr. Rogers. That’s a group I’ll always be happy to be a part of! What’s the Razoo team doing here? Finding a few choice phrases and sharing them, simply and elegantly. Easy enough for anyone to do, really. This got me thinking that part of the reason we don’t create and share enough of our own work is that we set the bar way too high. Our job isn’t to be brilliant every day and to say something that’s never been said by anyone anywhere ever. I’ll say that again: our job is not to say something that’s never been said by anyone anywhere ever. If that were our job, almost everyone would produce nothing. Our job is, quite simply, to give something of value to a like-minded community. Tiny observations, drips of inspiration, curated content about something we are passionate and have a point of view about…these all count. It is in the act of giving, consistently, to that community that our voice gets stronger. And as our voice gets stronger, so does that community. Ira Glass nails this point perfectly in this NPR video interview. What’s particularly great, which I only heard because I’m writing this blog post, is that at minute three he plays a tape of a broadcast he did eight years into his job at NPR, and explains why it is terrible. Just terrible execution of a good story idea. Eight years in, and Ira Glass, future winner of the Edward R. Murrow award, wasn’t any good. If you care at all about building your capacity as a communicator, listen to minutes 3-5 which include Ira’s one-sentence take on what the story really was. All of us who get into creative work, we get into it because we have good taste. But it’s like, there’s a gap…That for the first couple years that you’re making stuff, what you’re making isn’t so good. It’s not that great. It’s trying to be good, it has ambition to be good, but it’s not quite that good. But your taste, the thing that got you into the game, your taste is still killer. And your taste is good enough that you can tell that what you’re making is kind of a disappointment to you, y’know what I mean? A lot of people never get past that phase. A lot of people, at that point they quit…. And the most important possible thing you can do is do a lot of work. Do a huge volume of work. Put yourself on a deadline…Because it’s only by going through a volume of work that you are actually going to catch up and close that gap. And the work you’re making will be as good as your ambitions. Go out there and create something. We read you because you are you. Because you sound like you, talk like you. You are identifiable, clear, and you have a point of view. Whether that is polished or rough, grammatical or not…whether you use ellipses and start your sentences with “and” are all part of what make you you. We read you because you teach us, or challenge us, or make us laugh. You give us a feeling we’ve come to expect most of the time, and a feeling that surprises us some of the time. By reading you we tell ourselves a little something about who we are. When we share what you’ve written with others, we are sharing what you’ve said and, also, shared a glimpse of what makes us us. We can’t read “you” (an identifiable someone) if we can’t identify you, if you don’t sound like something. If you’ve read this far and are still nodding, you’ve got no choice but to conclude that your organization’s voice isn’t supposed to sound like nothing and no one. If you’re nothing and no one, we won’t miss you when you’re gone. Public speaking is neck-and-neck with fundraising on the list of things people consistently fear. To avoid that fear we often choose to read to people rather than speak to them. That is, we write down and recite prepared remarks. If our goal is to get our words across, this approach is guaranteed to succeed. Visually represented, if we read typed-up remarks we’re likely to say nearly 100% of the words we have written down. Of course people didn’t show up just to hear your words, they showed up to hear you. Yes they want you to have done the heavy lifting of thinking about and synthesizing your remarks. Yes they expect that you’ll practice what you’re going to say with trusted colleagues and friends before you speak to get it right. So yes, prepare. But also remember that you are so much more than the words you put on that page. You are a human being and people are desperate for human connection. They want to feel and experience what makes you tick and how your mind words. They want to interact with you, even if you are up on stage and they are part of an audience. And most of all, and easiest to forget, they want you to succeed. They are good people and they want good things for you. Also, if you succeed then they do to – they learn more, they have more fun, they get a glimpse of you. The speech read head down, in a monotone, is nearly always devoid of human connection. Air flows back into the room when the speech-reader looks up, smiles, and says even one extemporaneous remark – the smiles from the audience aren’t just because the remark was funny, it’s because they’re breathing a collective sigh of relief when they glimpse your humanity. And that glimpse is missing when your attention turns from them to the piece of paper you’re holding in your hands. That connection is lost. The reason error avoidance (aka “reading what you wrote down”) feels like a reasonable tactic is because it masquerades as a way to ensure that we avoid failure. But what do we mean by success? Because we know that, when we all start out, it’s nearly impossible to overcome the terror of standing up on a stage and ALSO get our point across without some help from our notes. But the decision we can make is to recognize that someday we want to break free, someday we want to speak to people not read to them, someday we want to feel comfortable and maybe even a little bit happy up in front of people telling them our story. 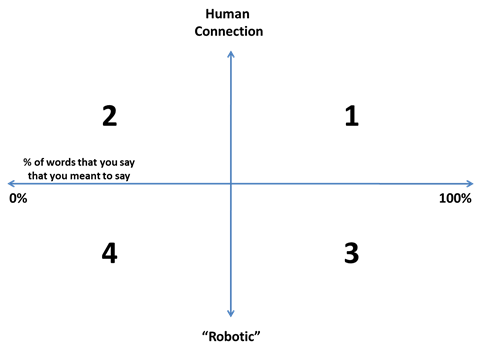 Conceptually, we can break free a bit by asking ourselves whether quadrant 3 really is better than quadrant 2: that is, is standing up reading something we could have handed out actually better than saying a small fraction of what we thought we meant to say but making a real human connection? Before you answer, you might remind yourself that the audience is at the edge of their seats, wanting you to succeed. I’d trade error avoidance for human connection any day. Especially since I know that when you speak from the heart, you’ll speak your truth. Not long ago, I spent an entire day going around New York City without my iPhone. There’s nothing like being device- and newspaper-free on the NYC subway to realize how our devices are creating bubbles of separation in every public space we occupy. And I think something’s getting lost there, something that has to do with the very fabric of society. Yes, we’re all squeezed in to that subway car together, but we’re separate, and we certainly don’t have to look each other in the eye and recognize each other, see who each person is and think just a bit about their story and how it relates to ours. Try this: take two trips on the subway or bus (or even an elevator) today without looking at or touching your device. Just look around and notice the bubbles everyone has around them. While the biggest highlight of my trip to Karachi last week was definitely meeting all the applicants to the Pakistan Fellows Program, the most fun and surprising piece was getting to play squash twice during the week. Pakistan has an incredibly illustrious history in squash – Pakistan dominated the sport for nearly five decades, starting in 1951 when Hashim Khan, a former squash coach in the British Army, won the British open (dominating then champion Mahmoud Karim of Egypt 9-5, 9-0, 9-0), and carrying through the reign of Jahangir Khan, considered by many to be the greatest player ever to play the sport – he won the Squash World Open six times and the British open 10 times, and had a 555 match winning streak from 1981 to 1986. Unfortunately since 1998, when Jansher Khan was defeated in the finals of the British open, squash has fallen from prominence in Pakistan, but there remains a proud history and tradition in Pakistani squash. And so, the day I arrived in Karachi, after 20 hours of flights and then heading straight to the office to work, I was particularly excited when my Acumen colleague Humza Khan dusted off his squash racquet and took me out for a game. As I told Humza, on my spectrum of ways to spend a first night on the road, if the bottom of the spectrum is being alone in a hotel room ordering room service and watching crummy TV (and not being able to sleep because of jetlag), pretty near the top of the spectrum is getting to play a good game of squash with some (new) friends. Yes, Karachi can feel very foreign, but to get the chance, within 12 hours of arrival, to step on a squash court with a colleague and then rotate through games with a bunch of other guys who were playing…at that moment when you’re on the court, everything else drops away and you are just two people playing a sport that you love, interacting as equals and using the shared vocabulary of a game. And in that moment you glimpse and feel your shared humanity with ease. It made me think that it would be fabulous if it were easier to travel places and find a great squash match, cricket game, game of pick-up football, you name it. What better way to really get to know a place? After our game that night, Humza (who does amazing work with youth football in Karachi) and I got to talking about sport, and he shared that the only time Pakistan feels and acts truly like a nation – and not tribes or sects or groups with regional differences – is when Pakistan plays a cricket match. In sport we are human, and for a few brief moments all that makes us different is stripped away. I wonder how we might access that feeling and spirit more often.